June 24th through July 6th the youth of Vineyard Community Church are going to pour their love into the beautiful people of Thailand. For a portion of the trip their team will be in Bangkok working with a church in the city, the remaining time they will be in Chaing Mai, which is a more rural city in the Northeast of the country. Thier team will be both doing practical things such as: a vacation bible school for refugee children and helping to repair and build in areas that have been affected by recent flooding, and blessing and ministering to the hearts of the people. We are asking for your support for this amazing team financially for this journey. Each member of the team is responsible to raise their own funds, but they are also doing some fundraising together as a team. 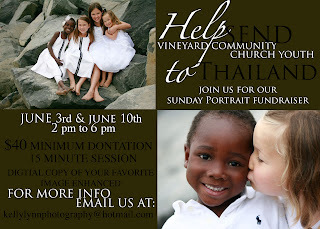 Kelly Lynn Photography's Sunday Funday is one of these fundraisers. Any funds given will go into a pool for the whole team. Our goal is to help these amazing young people reach out and do something that matters. There are a couple ways you can help!! Also be aware that 50% of any additional print orders made will also go towards this fund. 2) If you would like to give online it can be done at www.vccgn.org. Click on the “Giving” tab then select “Give Now” on the next page. Then select “Event Donation” in the giving options. In the Notes, Comments and Suggestions box please write, "Global Network". Then fill out the required billing information.